Food plays an important role in bringing family, friends, and relatives together. I love entertaining my friends and family with my special recipes. Snacks recipes are the one which i love to experiment with. I used to make varieties of snacks and love to make a twist in snacks each time. My hubby dislikes having his evening tea without any single snack. I mean, not the fried snacks all the time but he needs something to savor along with tea. This made me experiment more in snacks. I have shared lots of snacks recipes on my blog, especially sweet snacks. Recipes with ripe plantains / ethakka / nenthrapazham are always special for me and my family. Unnakaya, kaya nirachathu, pazhampori, pazham pola, pazham vaatiyath, pazham puzhungiyathu, paal vazhakka like so I have shared many traditional malabar snacks on my blog. 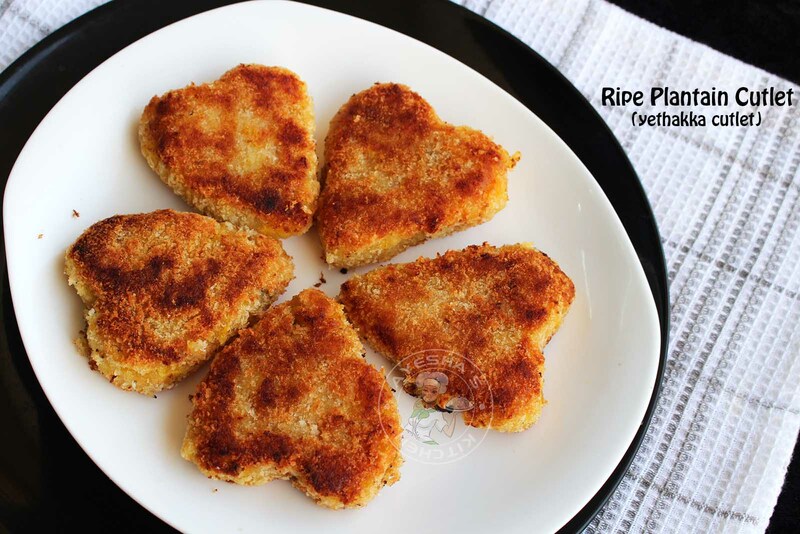 I love to combine mashed plantain and scraped coconut to make cutlets which are very less mess and less time-consuming snack. Here am with a sweet snack recipe with plantains and scraped coconut. This banana cutlet is very simple to make and is shallow fried in less ghee or oil. So do try this banana snack/banana cutlet for iftar and do let me know how it turns out for you. Here is the recipe showing how to make ripe banana cutlet / pazham cutlet / yethakka cutlet / plantain recipes / mashed plantains /sweet plantain recipes /fried plantain recipe /healthy sweet snacks / sweet treats /cutlet recipe / healthy snacks for kids /Kerala snacks / recipes for snacks / recipes for kids /evening snacks Kerala. Boil the plantains (cut into halves) until done with required water and a pinch of salt. When done drain the water, discard the skin and mash the plantain well without any lumps (very important). Now combine together mashed plantain, scraped coconut, sugar, a pinch of salt, cardamom powder. Take a small portion of the dough, shape it using any cookie cutter or heart shapes. (or just make balls and slightly flatten it). When done, coat it with bread crumbs on all sides. Heat a pan with ghee/oil. Shallow fry over a medium low flame until both sides are done. Flip carefully. Serve along with a nice cup of tea.